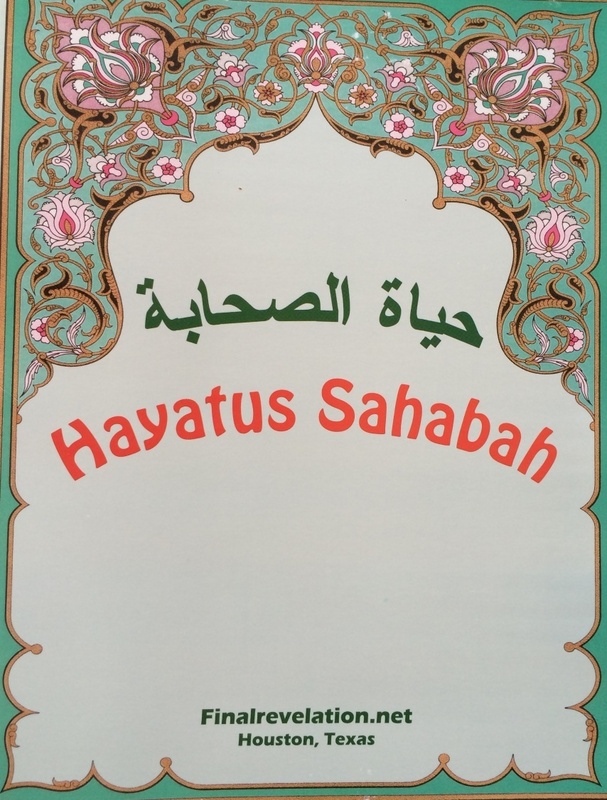 See the Utube video and order: https://youtu.be/0NjUPukfrNc ............One of the great achievements in these modern times of this century for the cause of Da’wah / Tabligh i..s the book ‘Hayatus Sahabah’ compiled by a great scholar, Maulana Muhammad Yusuf Kandhelwi , Delhi, India. He not only dedicated his life for the cause of Da’wah / Tabligh but compiled this book as he felt the need at this time with the details about the efforts, sacrifice, and struggle of Rasulullah and his companions. This book shows the examples of Rasulullah and his companions in their efforts as a guide for all Muslims around the world to follow and benefit. The work of Da’wah / Tabligh is now a global effort to revive the understanding among the Muslims to take on the responsibility. When Rasulullah said, “Convey from me even if it is a single verse.” (Bukhari) and that he is the last Messenger, it is obligatory on every Muslim to do the effort of Da’wah. The original book was written in Arabic with 3 volumes. The general Muslims who are involved in the effort of Da’wah / Tabligh do not have easy access to this great book. Sheikh Maulana Saad of Nizamuddin, New Delhi, India, recently emphasized the need for Muslims to use this book as a guiding tool in the efforts of Da’wah / Tabligh and benefit from it. In order to have this book available for the general Muslims who are involved in the efforts of Da’wah / Tabligh, the translation of all 3 complete volumes is compiled in one volume with easy English and a minimum number of Arabic terms so it is easy for all Muslims around the world to understand and benefit from it. All stories, subject categories, and chapters can be found in the same book. The Table of Contents lists all 19 chapters at the beginning. Since it is a big book, every effort was made to format each of the 19 chapters to easily identify titles, headings, topics, etc with their pre-set page numbers. The translation of all Qur’anic verses are in italics from the Noble Qur’an of Darussalam, Saudi Arabia with their locations. All references of Ahadith are inserted at the end of each Hadith in italics rather than at the bottom of the page in order to clearly show their sources. May Allah help and guide all Muslims around the world to benefit most from this great book in the efforts of Da’wah / Tabligh.